The term 'chalking' refers to the formation of a white, chalky powder on the surface of the paint film. This condition often occurs as the paint weathers and the binder is slowly degraded by sunshine and moisture, releasing the binder's hold on the pigment. Over time nearly all paints will show some chalking when they are subject to outdoor exposure. Paints are essentially a combination of pigments - colour particles held together by the paint resin as the paint dries a thin layer of clear resin is left on the surface and the colour pigments are locked in below this layer. After years of UV attack this thin resin layer simply wears or erodes away - exposing the pigments below and as they are no longer bound into the paint film by the resin they are easily wiped off and this is what is referred to as chalking. The slow erosion as described is much more preferable than cracking or flaking and, provided the surface is sound and cleaned, once the chalk is removed it is ideal for painting over. Chalking is especially prevalent with flat paints and white or very light-coloured paints that contain high levels of titanium dioxide and extenders. A low degree of chalking is often beneficial to whites and off-whites, since it tends to rid the surface of a certain amount of dirt and mould. It can erode the paint film resulting in a loss of protection to the substrate. Old paint is likely to be chalky. The 'chalk' is the powder (other than dirt) that comes off on your finger if you rub it over old paint. This is pigment from the paint coating that has been released by the paint binder as a result of sun and moisture degradation. This is to be expected and will be worse if enamel paints or lower gloss level acrylics have been used. Pigment residue and other surface contaminants like dirt, road grime an residual mould (once it has been killed) need to be removed before painting as any coating applied over the top will adhere well to it but the paint needs to adhere to a sound surface, otherwise it will in time flake off. Many complaints Resene receives relate to poor surface preparation and a failure to remove the poorly bound surface before painting. Chalk needs to be removed before repainting and can be considered to be in the same category as dust and dirt. 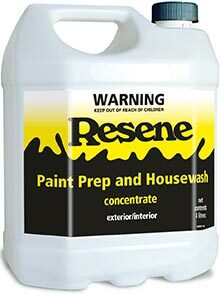 The use of Resene Paint Prep and Housewash is recommended as part of the chalk removing process. Simply dampen the surface with fresh water, and scrub - ideally with a soft bristled brush or broom. Waterblasting is a common surface preparation method when preparing concrete or plaster and when you need to remove flaking paint. But as a rule, and certainly for weatherboards and exterior joinery, washing with Resene House Wash and Paint Prep is much more effective and quicker than waterblasting.